An eclectic handmade collection of Sophisticated Funk! Announcement Hey! Thanks for shopping! Take 20% OFF your order of $20.19 or more 2/17-2/18 in honor of President’ Day! Use code: ROCKIT2019 at checkout! Hey! Thanks for shopping! Take 20% OFF your order of $20.19 or more 2/17-2/18 in honor of President’ Day! Use code: ROCKIT2019 at checkout! Why did I start making jewelry? It's pretty simple: I have always been passionate about fashion and love things that allow me to express creativity in my daily signature style. This endeavor was not meant to be a business venture by any stretch of the imagination – in the beginning. I just grew weary of spending ALOT of money for accessories that "everyone else" was wearing, or that didn't properly (or comfortably) fit my full-figured frame. At it's inception in 2005 - I started with one or two fun little pieces...I revamped the branding/image/vibe in 2009 to focus my energy on my love for wire-work, and its been an amazing ride ever since! I joined Etsy in 2009, but had not tapped into the full potential of using this marketplace until this year (2013) when I decided to list my most popular custom items. It's been quite the amazing experience! 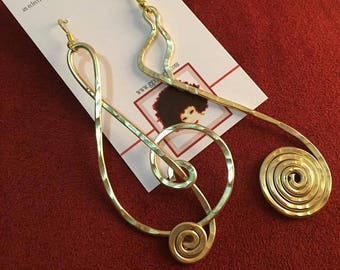 Thanks for your interest in my wearable art! I make it my business to bring you the latest in hand-crafted fashionable and funky accessories & artistic wire-work!